Potatoes get a bad rap because of the misconception that they are fattening. Potatoes unto themselves are not “fattening,” but they certainly become less healthful after they have been peeled, deep-fried in over-heated, refined oil or turned into chips or mashed with their weight in butter and cream (not that those don’t all taste lovely.) 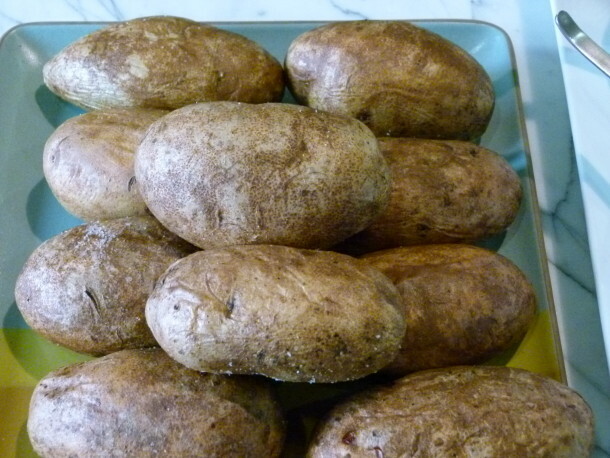 The classic Russet or Idaho baking potato is a perfect example of a whole food. It came into this world as a package of vitamins (such as C), minerals (like potassium) and fiber. When eaten that way, the potato offers its maximum health benefits. Unfortunately, the majority of the potato’s nutrients are concentrated in the skin and just below. Therefore, when we discard the skin, we do miss out on the best part, nutritionally speaking. 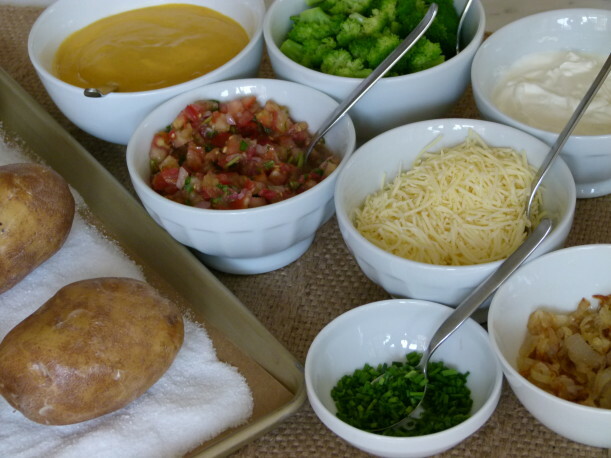 One of the reasons I love baked potatoes is because I can set up a topping bar at dinner and everyone can customize the way he or she wants. I find that the kids eat more of something when they are given the opportunity to control it. I enjoy my baked potato with a dollop of strained goat yogurt (my version of sour cream) and some chopped chives or scallions. I allow my 7-year-old to put a squirt of (fruit-sweetened organic) ketchup on his and the girls tend to like butter and some steamed broccoli. We can turn the potato into a meal if there’s some vegetable chili from the night before that I can dollop on top. Yum! 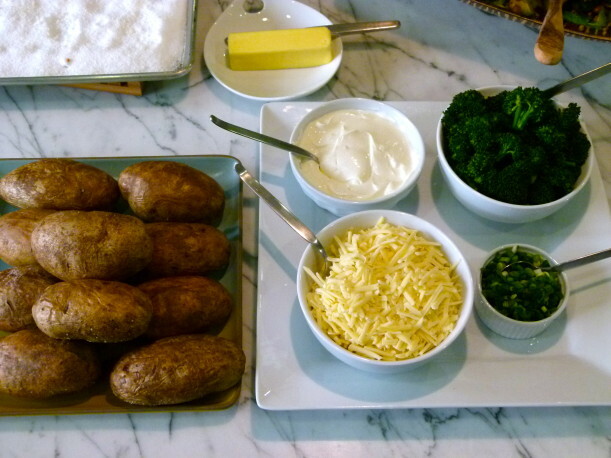 Scrub the potatoes, dry and rub each with 1 teaspoon of butter. Pour a layer of salt on the bottom of a shallow baking dish or cookie sheet. 1½ cups is perfect for a 13 x 9 -inch dish. Place the potatoes 2 inches apart on top of the salt and bake for 50 minutes, until tender. 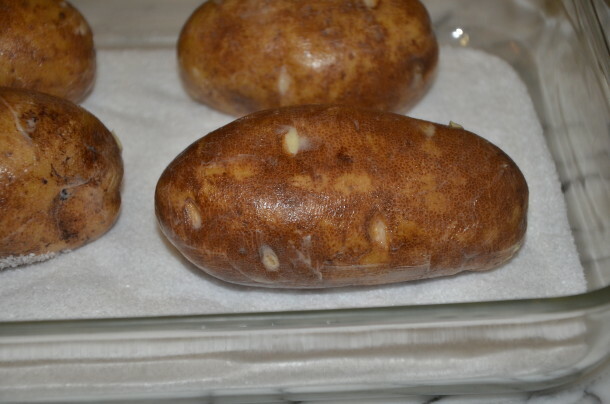 When each potato is removed from the baking dish, rub off any salt clinging to the bottom of the potato. Split open lengthwise and top as desired. Hello, would you please let me know the purpose of using the salt in this recipe…just curious. Thank you! Thank you for this. I was googling for ideas on a vegan baked potato bar. I make my baked potatoes the exact same way. But I do not use any salt at all. They turn out fine. I often make a whole bag of potatoes, then as the pan comes out of the oven, I quickly wrap the potatoes in cut-to-size pieces of aluminum foil. The foil both helps to keep the potatoes hot for the meal, and it helps the skin to pop right off when they are unwrapped. Since using 1 1/2 c salt, when you are done baking potatoes, can u reuse the salt. Thats alot of salt for one recipe? You’re right it is a lot of salt that would go to waste, but kosher salt is really inexpensive. I suppose you can use it in a soup or marinade or to season a chicken! 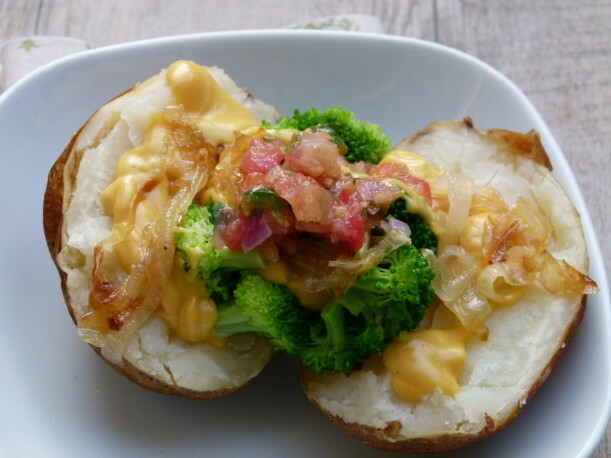 A perfect baked potato…oh so simple and so truly delicious!!! My family looooooved this recipe! Each of my three kids enjoyed ‘creating’ their own masterpiece with the toppings bar which included an assortment of green vegetables. My six year old daughter made her potato spinach, broccoli and asparagus! Thanks! I was e-mailed your website by my BFF and i was up until 2am reading thru every single recipe. Wow! i was tempted to run out and buy ingredients but instead i jump started dinner the next night with one of your ideas. My four year old daughter who refuses to try new foods or same foods in a new way was completely into “the Bar” idea, as i know call it. I was making chicken soup which she loves but her idea of chicken soup consists of brooth and pastina. I then asked her to put three ingredinets into small le Creuset pots and set them on the table. i told her she would be able to spoon in three vegetables of her choice into the soup. IT WORKED! three vegetables in her soup! We owe it all to you. Friends may become concerned when they here her ask if we are setting up a bar for dinner but hey i know its a good thing. Well i was away for the weekend but have my grocery list ready for tomorrow. I am excited to try your recipes and great ideas on getting my daughter on board to try new things. It’s amazing how the kids respond when they are allowed to have a say as to what goes on their plates. I am really into the “topping bar” concept. We use it regularly for salad and oatmeal, but also for tacos, fajitas and some soups. It’s a win-win!